The days are getting longer and the sun is shining, what better time is there to get out doors and get active? 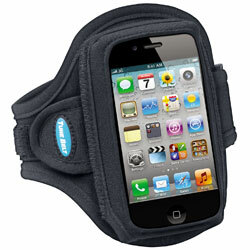 Why not utilise your iPhone 4 to its full potential, by turning it into your perfect exercise companion. One of the key advantages of the iPhone 4 is its inbuilt iPod, allowing you to listen to your tunes on the go as well as take calls and surf the net. Here at eoutlet, we want you to make the most of your time, and don’t want you to be trawling the internet looking for the best sports accessories for the iPhone 4, we want to do the hard work for you. 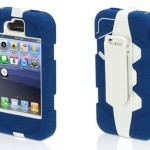 So below, we’ve reviewed the best armbands for the iPhone 4 and why they are worth investing in! 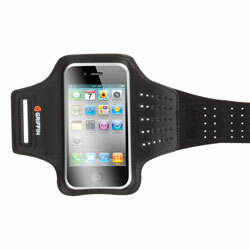 Tune Belt describe this armband as the “ultimate sports armband”, designed for all ranges of phones, it is ideal for the iPhone 4. Made from a comfortable and more importantly, washable, neoprene material, the AB82 slots your iPhone 4 in behind a viewable screen, allowing you to position it either the right way up or upside down so you can view it whilst exercising. The added bonus of the neoprene material is that it is comfortable, and lightweight, so you won’t feel like you are carrying a ton of extra weight on your arm. The AB82 also manages and stores your headphone cable so it won’t get in your way and further more it allows you access to the vital ports on the bottom of the iPhone 4. 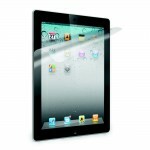 Throughout your use of the AB82, your iPhone 4 will be held in a cushioned and protective environment that will withstand energetic and consistent movement meaning you can carry on with your exercise whilst listening to your music and not have to worry about your iPhone 4 falling or getting damaged. When you think iPhone 4 accessories, Griffin often comes to mind. At the forefront of Apple technology, Griffin have developed some of the most unique and dynamic Apple accessories on the market and when it comes to sport accessories, they are no exception. The Griffin Aerosport Armband for iPhone 4 is designed to compliment your workout routine, providing safe and secure storage for you iPhone 4, as well as comfort and style. Made from flexible lycra with a wide strap, the Griffin Aerosport will stay in place whilst you move and won’t dig into your arm or prove uncomfortable. The clear front, allows you to still use the touchscreen of your iPhone 4 and the armband keeps the headphone jack accessible. Another little cool feature that Griffin have added to their aerosport armband is a hidden pocket, big enough to fit in your house key, so lack of pockets is no longer an issue. 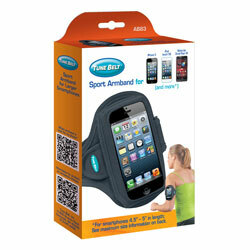 Another sports armband from Tune Belt has made it into our list. But unlike the previous armbands, there is a twist. It’s not for your arm, but in fact your waist. 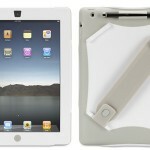 Yes, the Tune Belt Open View Carrier Belt for iPod Video is designed to snuggly attach to your waist rather than your arm, to deliver comfort and security when on the go. If you don’t like the thought of your iPhone 4 strapped to your arm, but still want an ideal carrying solution for your iPhone 4 whilst exercising, we definitely recommend this one. Made from the same lightweight neoprene fabric as other Tune Belts, the iP2 is washable, stretchable, secure and just about everything else you could want from a sports waistband. There is also a handy pocket at the back big enough for your keys, cards and spare change. The clear, protective screen at the front allows you complete access to your iPhone 4 whilst on the go, yet still protects that precious touchscreen from scratches and unsightly marks. With access to your iPhone’s headphone jack and vital ports and controls, what more could you ask for? The Tune Belt AB83 is pretty unique when it comes to sport armbands. Not only does it feature all of the benefits of Tune Belt’s design; neoprene fabric, stretchable, washable, but it is also bigger in design so will accomodate your iPhone 4 whilst still in its case. This is a fantastic design addition from Tune Belt as it eliminates the hassle of having to remove your iPhone 4 from its case everytime you want to us it in your AB83 armband, it also means that your iPhone 4 is doubly protected whilst on the go! As well as this, the AB83 features as standard the clear protective window, allowing you to continue operating and viewing your iPhone 4 whilst in the armband. If that wasn’t enough, Tune Belt have designed the AB83 to be as comfortable and secure as possible, not adding bulk, weight or pressure to your arm so your exercise will not be hindered. The AB83 is definitely a winning armband when it comes to iPhone 4 accessories, adding style, design and perfect functionality to your workout, allowing you to utilise your iPhone 4 to its full capabilities.